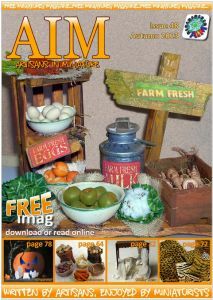 This article was featured in the Autumn 2013 edition of the online miniaturists’ magazine “Artisans In Miniature” (AIM). The original edition can be found listed on the AIM website, and you can read it in scribd format here (page 28). This month we are visiting the blog of Janet Granger, whose passion is embroidery, both full size and in miniature. We asked Janet to tell us why she had started to write a blog and she explained that for several years she had meant to start but had found that it never really got to the top if her ‘to do’ list. Then one day, after deciding that she really needed a place where she could chat about miniatures, embroidery and so on, Janet’s blog was formed. 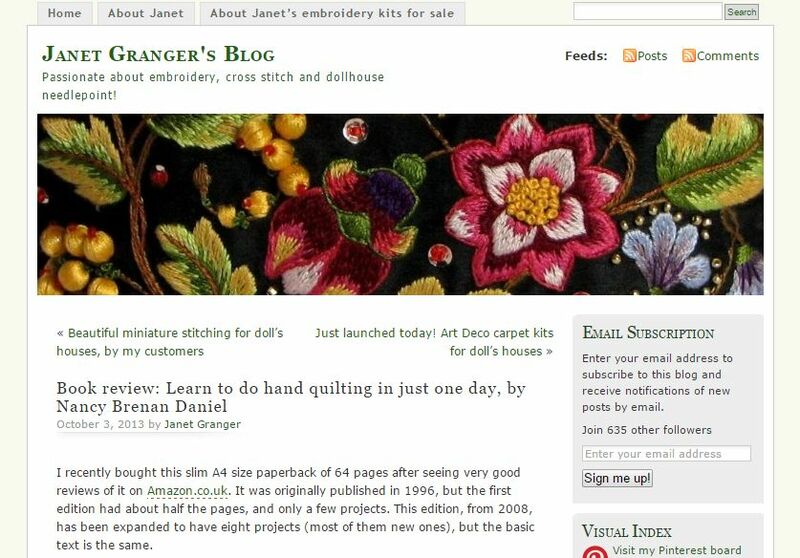 Janet does already use a website, www.janetgranger.co.uk, but as she explains, it is very focussed on information about the needlepoint kits for sale, rather than chat. On her website, there are pages about the miniatures hobby, of course, and some reproduced articles from magazines, alongside a huge section of tutorials, but Janet felt that there wasn’t much in the way of opinion. So, with this in mind, she thought that a blog would be a good but separate place to do that kind of thing. Janet began writing her blog in October 2009, and uses it to announce new designs for her miniature embroidery kits there first. This is because Janet feels that the blog format is simple to use and as she is (in her own words) “very impatient”, she can, sometimes, before the stitching is even out of the frame, photograph and upload it to the blog, with a ‘look at this – it’ll be on sale soon’ kind of text alongside. Janet laughingly explains that she just doesn’t have the patience to wait until it’s a finished item and all packaged up, photographed as a style shot, or whatever – she just wants people to see it NOW!! Janet also spoke to us about her other hobbies apart from miniature embroidery and these can be found on her blog also. Janet likes to chat about her most recent passions such as the recently started full-size patchwork and quilting. Janet explains that she gets very helpful tips and comments from the people who read her blog about where to get supplies for these larger projects from and so on. Janet will also use her blog to review books by people who she finds inspiring; usually embroidery books. Janet occasionally use her blog to write about things things that she does in her spare time, which wouldn’t ‘fit’ on the main embroidery kit website. For instance, she is deeply involved in doing Dances of Universal Peace, and she goes to dance events about once a fortnight, all over the country, so she has written about those a few times. She has also blogged about a couple of charities that she is involved with, when she wants to ‘spread the word’ a bit. Janet will also use the blog to share her experience on solutions to health problems that she has had. In fact, Janet explains, she use her blog to write about anything she feels like writing about. She loves to write, and finds that it comes really easily, whatever the subject! Janet finds the blogging community is, on the whole, very friendly and says that she has had some lovely comments when people have seen her work. Janet explained that “It’s often a surprise to ‘normal people’ (i.e. people who don’t do miniatures) to see the scale that we miniaturists work at. I have had some spam comments, and a couple of offensive things posted, but not so much that it’s become a problem. It’s still a great way to get feedback from people when there’s a ‘comments’ facility on a blog – that just isn’t possible with a website. I know there’s email, but people don’t think to email me with comments as often as they respond by posting a comment when they’ve read a blog post.” Janet feels that she has made contact with people through the blog that she wouldn’t have known about otherwise, and they wouldn’t have known about her. Looking at Janet’s blog, the design is quite subtle – a white background and simple font, with headings in dark green. The header image is what grabs people’s attention. It is a close-up of a piece of stumpwork embroidery, taken from a handbag (full-size) that Janet made a few years ago. It’s worked in bright colours, on black silk Dupion, so it’s quite dramatic. Janet did consider having some miniature embroidery as the header image, but decided that most people coming across the blog wouldn’t understand what scale it was, just from a picture, and as she chats about full-size embroidery as well as the miniature embroidery on the blog, it is still relevant. 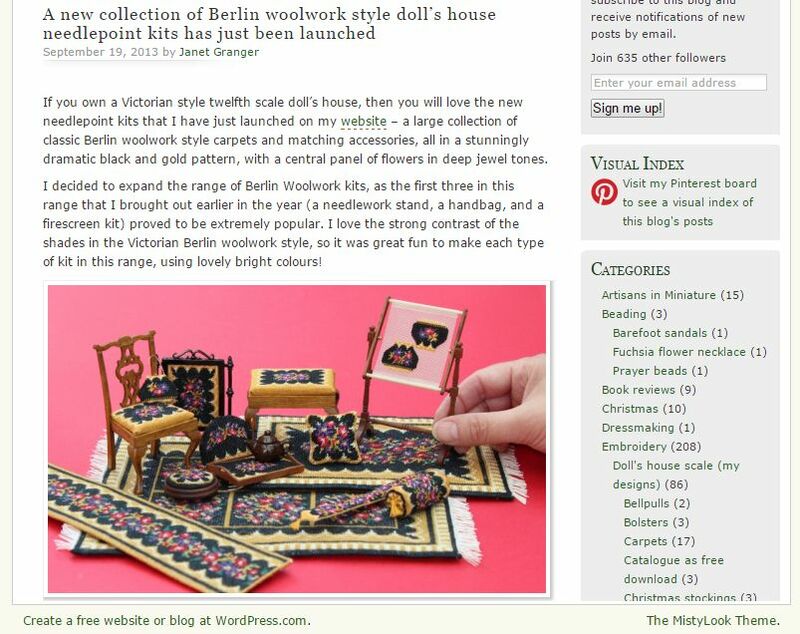 Janet does use some gadgets on her blog, but explains that she keeps her ‘blogroll’ (list of recommended websites) in her blog’s sidebar quite short – at the moment, almost all of these are to do with embroidery and miniatures. Finally, we asked Janet what best thing about having a blog? Well, Janet, having looked at your blog, I am sure everyone with a love for miniatures and/or embroidery will want to read it, as it is packed with beautiful stitching and informative posts!